You already know why you've chosen vinyl siding for your home--you like the idea of low maintenance and the fact that it comes in a variety of colors. Having a wide selection of vinyl siding colors to choose from might be great, but those options could make it overwhelming when it comes to picking a color for your siding. Blue: the color of the water and the sky around us; thought to be a calming and cool color, blue can encourage efficiency and can purify your thinking. Research even shows blue wins the popularity contest when it comes to color. Green: contains the powerful energies of the natural world; seen as tranquil, harmonious and refreshing, and the most restful to the eye; also represents ecology, and is the color of our monetary exchange. It often symbolizes balance in all things. Red: bold, exciting and stimulating; these hues demand attention and encourage action and confidence. Word of caution: A little red goes a long way. Brown: Earthy tones are approachable, stable and reliable. Generally speaking, they encourage a sense of wholesomeness. White: A white picket fence around a home symbolizes a protected and happy home life and enables fresh beginnings. The shade commonly represents purity and tradition. Gray: This neutral mixes well with other colors and never hogs the limelight. Gray is timeless, practical and rock solid. Here's something to think about: It might be desirable to stand out from the crowd, but do you want to clash with your surrounding neighbors? It could hurt property valves, and disrupt the good neighbor policy. Take along your camera and snap some shots of your favorite house color combinations. 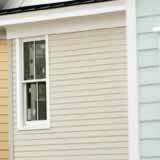 Then, get a hold of your vinyl siding contractor who can help you weigh your options and come to a final decision.